Are you a fan of in-play betting or trading? It’s getting harder and harder to make money through betting these days, but we are always looking to simplify the process. A tool we got to try out recently was the Football Scanner from Inplay Trading. 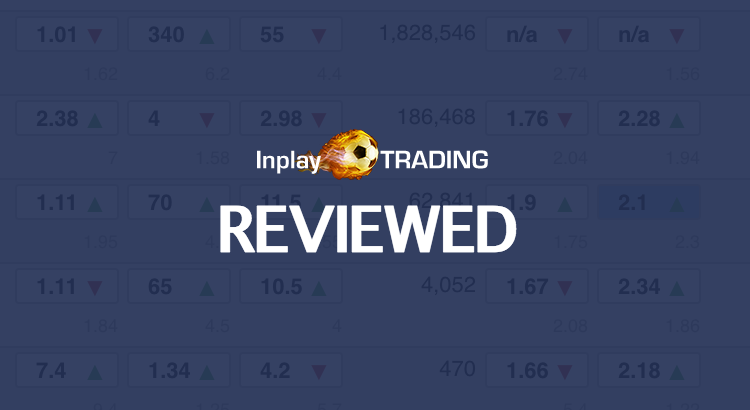 Read on to find out our honest Inplay Trading review and if you’d like to check them out for yourselves, you can sign up here. There are a number of different tools and features offered when you sign up to Inplay Trading. Thankfully, we’ve managed to try out each and every aspect of the site and we’ve reviewed them for you below. You’ll find a separate section for each of their products. The in play scanner is a real-time football statistics system with the aim of assisting you with your in play betting and trading. The scanner gives many stats including the match odds, money matched, shots on target and the stat to Inplay Trading that they call Pressure Index (PI). PI comes in two different variations – the creatively named PI1 and PI2. PI1 is calculated by using shots on target, shots off target and possession on a points based system every 10 minutes. PI2 is calculated in a similar way, but instead uses ‘dangerous attacks’ and corners, every 10 minutes. The higher the ratings of PI, the higher the probability of a goal or corners. Once PI levels reach a certain height, they will be highlighted as to alert your attention. Many traders and bettors have various strategies that can be improved based on the information collected from the scanner. Another great feature the scanner has is the ability to add multiple strategies that can be saved and quickly flicked between. There are extremely helpful tutorials on the site that will help you set these strategies up, and you can gradually tweak them over time to optimise your personal preferences based on stats, odds, minutes played and more. This enables you to be quick and efficient with your betting and prevents you from missing out on crucial information at vital times. Another popular feature within IPT is something called the Draw Inflation (DI) table. The DI table shows numerous football matches that will be played on the same or next day and also displays the match odds and the DI %. From this you can determine whether a game has a high or low DI% and therefore place bets on this information. Typically, if a game was to have a low DI% you would back the draw and lay the underdog. If you have a high DI% you would do the opposite; lay the draw and back the underdog. This strategy is really good for progressively building your bankroll over a long period of time, and requires less thought than the fast nature of the Football Scanner. If you aren’t quite sure how this works then you can find all the information you need to under their really useful ‘Help’ section. IPT really is on the ball when it comes to its customers needs. When you first join, they completely understand that things may appear a little scary or confusing. To help with this, IPT have included thorough and detailed videos of all their tools in action. You’d be surprised how easy it is to pick everything up – we had a comfortable grasp of it within 48 hours of signing up. Once you’ve advanced with your understanding of the software then there are other videos that explain different trading strategies and betting strategies you may be interested in learning. Last but not least, the chatroom that IPT has is insanely useful, especially when it’s available to all members. From beginners to experts, everyone comes together to discuss and help each other with strategies and tips. The chatroom offers two separate chats; Pre-Match Trading (PMT) being the first where discussions are made about bets and trades that can be placed before the football match has started and get you into a winning position before the match goes in-play. The second chat is for in-play trading (IPT), trading the horses (TTH) and racing trading alerts (RTA). These fit nicely with each other as the horses are usually in the day, and football is often on the evening. The IPT chat is where people discuss bets or trades that can be placed based on information showing on the in play scanner and experience user knowledge. TTH is where a small number of experienced guys give tips and trading strategies which have a high success rate. These strategies include scalping, back to lay (B2L) and lay to back (L2B). RTA is a system that recognises horses that are going to ‘steam’ – this is when a horses odds are going to come flying in – and gives alerts via email or on the chat. These alerts mean you can get on the trade quickly and scalp a few ticks. We are really big fans of Inplay Trading – and we can definitely recommend that you sign up to them. You can do that via this link. We have awarded Inplay Trading and their tools a rating of 4.5 out of 5 – which is high praise from us. Their tool is innovative and provides unique insight. Their chatrooms offer plenty of value to all users. The only reason we haven’t awarded them a full 5 star rating is because of their pricing, which comes in at £20 for fourteen days, £39 for a month, £106 for three months or £191 for six months. This pricing is immense value. It can earn you hundreds or even thousands of pounds going forward if you put the work in and stay disciplined. We felt it would be too inconsistent to award IPT a perfect rating at this time. But we just have to find a way to be consistent when reviewing some of the best products in the industry. After all, we need you to be able to trust what we’re saying. HOWEVER, we are still happy members of theirs! You absolutely can make consistent, high-level profits each month with Inplay Trading. We are members of both IPT and Oddsmonkey; we like to have a good mix of sports betting, trading and matched betting going at all times so we can give you well-rounded advice. Hi mate, any chance you could post a week, 1 month or 3 month P/L from using this site? To me it seems like it does nothing more than monitor basic in play stats which are available on any bookie. The only thing that makes it stand out to me is Pressure Index! Would you say IPT is better for those learning to trade, in regards to reading the game and stats? Trading is a very personal thing also so the tipping forum to me defeats the point trading slightly. Also do you know who runs the site? Isit a pro trader or anyone with high levels of credibility? Will get one of these sorted when the season is up and running again. The stats are available on the bookies, but you’d have to click from game to game. Being able to see them all in one place means that games are identified and highlighted for you without having to constantly trawl through games. The pre-match football trades from the forum are pretty good imo. Not sure on the background of those behind the site. I signed up for the inplay scanner for a month had my biggest one day loss using it enough said ,I do better just using stats on 365 just a waste of money. That’s unfortunate to hear Malcolm, but I’m struggling to see how it can be the fault of the scanner? The scanner provides exactly the same information as Bet365 does but with a whole load extra on top.